Momentum Gallery in downtown Asheville NC will be presenting a collection of my work spanning from 2012 – 2015. 'Lace’, ‘Distilled Portraits’ and ‘Veil’ will feature in 'Summer of Glass', a celebration of the medium in conjunction with the Chihuly exhibition at the Biltmore Estate.The exhibition, running from July 1 – August 25, 2018 nods to the Gilded Age, a period during the late 19thCentury when the Biltmore Estate was conceived and constructed by railway tycoon George Vanderbilt. This curated show features recent work by some of the country’s top contemporary glass artists and responds to Vanderbilt’s dream of opulence, grandeur, and beauty. Stylish sculptures and sophisticated wall pieces incorporate a variety of glass techniques and reference the intricate detailing, ornamentation, and drama indicative of the Gilded Age. A body of my work will feature in 'Evolve 2018', alongside artists Cassandra Straubing and Kathryn Wightman. 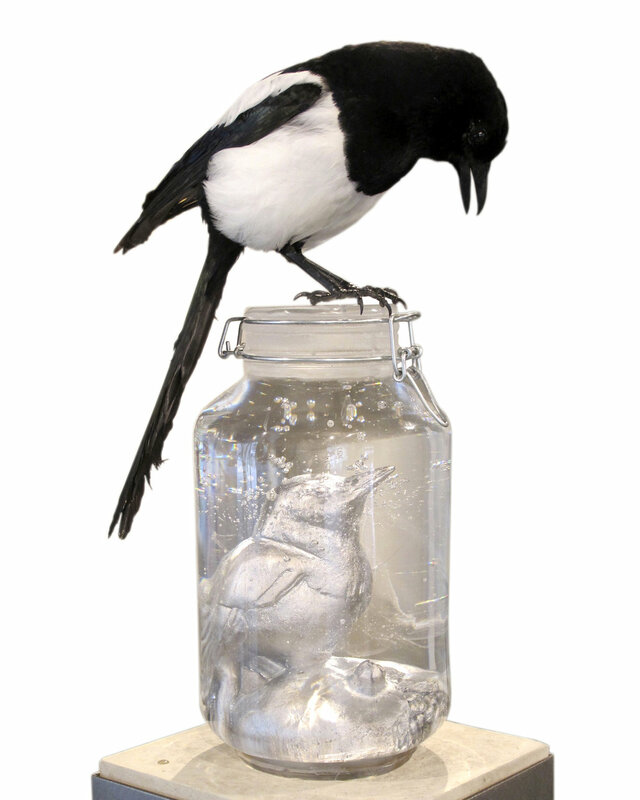 This three person show, put together through Bullseye Projects in Portland, OR will coincide with E-Merge, a juried biennale award exhibition celebrating work made in Bullseye glass. Evolve is a companion exhibit that celebrates former Emerge finalists who have continued to create works that expand the medium. I've been working on some preliminary studies for a much larger piece which I hope to complete by the end of summer. The simple arrangement of 16 carved black glass tiles (see above) took inspiration from a carved marble façade in the interior of St Mary's Chapel in Sudley, England. The embellishment is a very small component of the alter area, the chapel being famous for its altar-tomb of Catherine Parr, the 6th and last wife of King Henry VIII. Here, the details of foliage are left with a black satin surface. Only the high points in the design are polished in order to give contrast and a noticeable line quality in the texture of the relief. History aside, I was drawn to the intimate detailing in this wall motif, which is very much understated in its positioning inside the chapel. It led me to compose the installation sketch seen below. 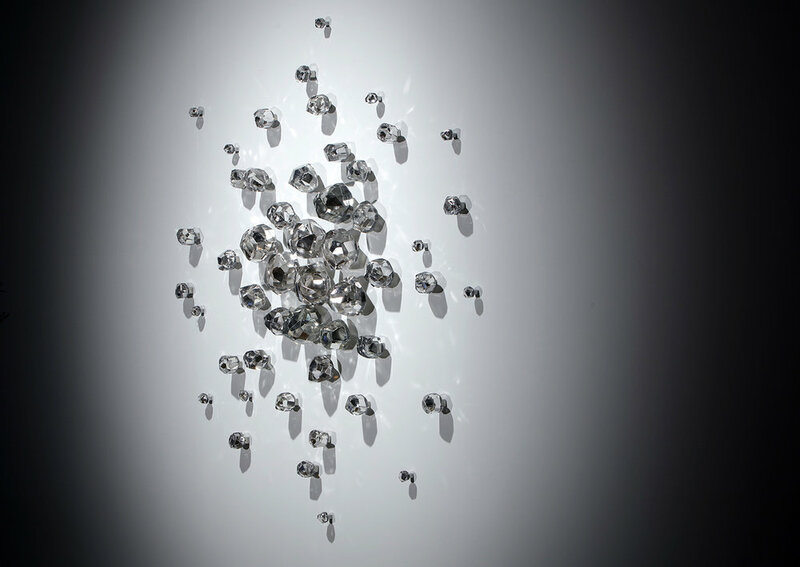 I have taken the focal elements in the wall design and have broken them into individual units that are comprised of diamonds, circles and rectilinear formations. The chapel façade is replicated, yet looks to dilute and fragment as it expands outwards. The last 6 months have been a whirlwind to say the least. With the completion of a touring exhibition, 'Young Glass' that finished its travels at The National Glass Center, England, two visiting artist lectures at The Royal College of Art, London and The California College of Arts, Oakland as well as one workshop down and 2 to go, its been a busy start to 2018. Oh, and I've been grappling motherhood...a full time job in itself. 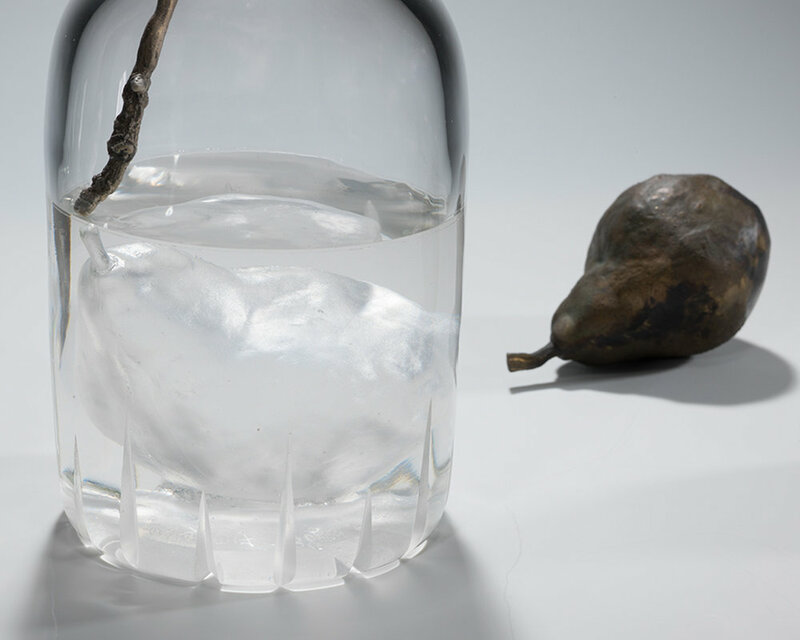 I am delighted to announce that 'Demeter II', 'Distilled Portrait' and 'Bottled Pear' will be exhibited at this years Design Miami / Basel, Switzerland through Todd Merrill Studio from June 12-17. This is the first time that my work has been featured within this international platform for twentieth and twenty-first century furniture, lighting and objets d’art. My work will be presented among excellent company, including Molly Hatch, Sophie Coryndon, and Shari Mendelson to name only a few. Although I cannot attend in person I am excited to have my work presented to new collectors, designers, curators and critics from around the world. 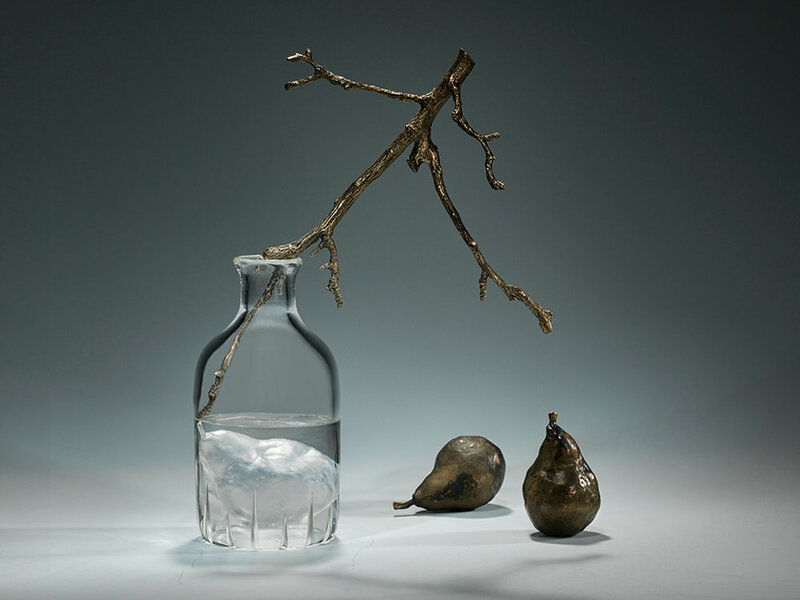 'Demeter II', 2018, Cast Glass / Stainless Steel / Aluminum, 33.5" x 33.5" x 3"
'Bottled Pear', 2018, Cast + Blown Glass, Bronze, Patina, 16" x 14.5" x 4"
'Distilled Portrait', 2014, Cast Crystal / Mirror / Stainless Steel, 16" x 5" x 5"
'Indra's Web', 2015 will be showcased at Salon Art + Design in Park Avenue Armory, NYC this year with Todd Merrill Studios. This is the second occasion that the 50 piece installation has made its way to the big city, after having been debuted at Collective Design, NY in the Spring of 2016. 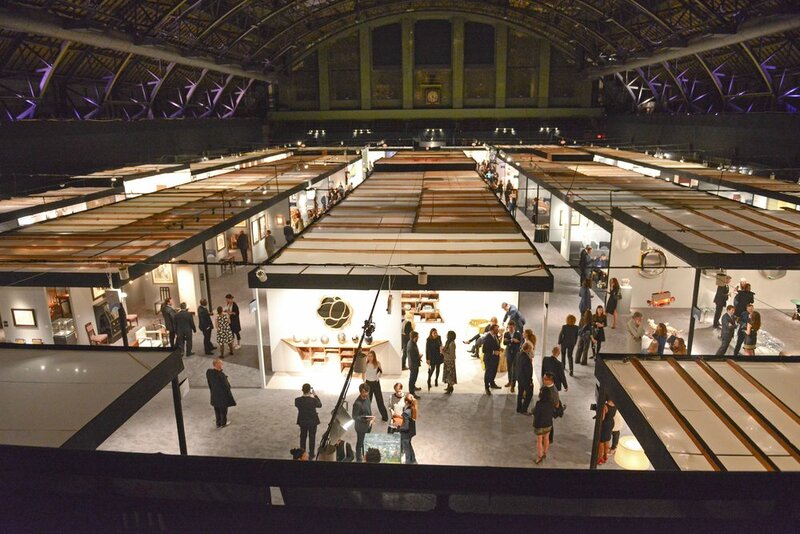 Opening night at Park Avenue Armory. Image courtesy of Architectural Digest. "The Salon Art + Design welcomes the world's finest international galleries exhibiting historical, modern and contemporary furniture, groundbreaking design and late 19th through 21st century art. Visitors will find designs by the great 20th century masters, as well as creative works by today's most innovative young artists. Look for Art Deco, Mid Century Modern from America, France, Italy, and Scandinavia paired with the work today’s emerging designers. The Salon’s inclusivity and willingness to consider both fine and decorative art in the context of contemporary life is predicated on the intent of designers and collectors to create environments rather than simply amass objects. The Salon is the only international fair of this caliber to combine styles, genres, and periods cutting a universal and timeless swath. Other fairs allow art, but no design or conversely design without art. The willingness to consider all material—historic to contemporary—is based on the belief that today’s designers and collectors insist on a vibrant mix—as long as the quality is impeccable." 'Demeter', 2017, Cast Crystal / Aluminum, 33.5" x 33.5" x 3.5"
'Demeter', 2017 recently made a debut in 'Momentum', a juried exhibition of contemporary art made primarily in glass. Organized and hosted through The Arts Commission of Greater Toledo and River House Arts Gallery, Demeter won second prize within the show and was purchased by ProMedica for their public art collection, which will be installed in their new hospital building in the Fall of 2018. 7th Floor Gallery at The Secor Building, Toledo OH for the 'Momentum' exhibition. Zac Weinberg's, 'Believe', 2016. Neon, Metal. Dimensions Unknown. The exhibition included artworks from regional and national artists working in glass, glass related materials, or materials referencing glass to celebrate the unique narrative and works that evolves from it. Guest jurors Michael Killoren, Jennifer Navva Milliken, and Raul Parades selected the following: First Place: Jennifer Hecker (Brockport NY) "Water Fall," Second Place: Joanna Manousis (Toledo OH) "Demeter," Third Place: Shahid Khan (Gahanna OH) "Minar Trio in Turquoise," Honorable Mention: Kazuki Takizawa (Los Angeles CA) "Container: Handle Wings," and Honorable Mention: Zac Weinberg (Toledo OH) "Mechanisms for Spectacular Experience." [Click Here] to see the full exhibition catalogue.